Using SendMap (or similar utility) to upload maps to Garmin GPS mapping units can be an exercise in chance since it's hard to determine which .img file corresponds to what area. The utility below aids the effort by scanning a directory of .img files and displaying the area/description fields associated with each file. Select the image file directory either by browsing to the folder (by clicking on the folder icon) or by manually typing in the path. Check the "CSV output" checkbox if you would like the output to be comma separated values (CSV) otherwise the output will be formatted for viewing. 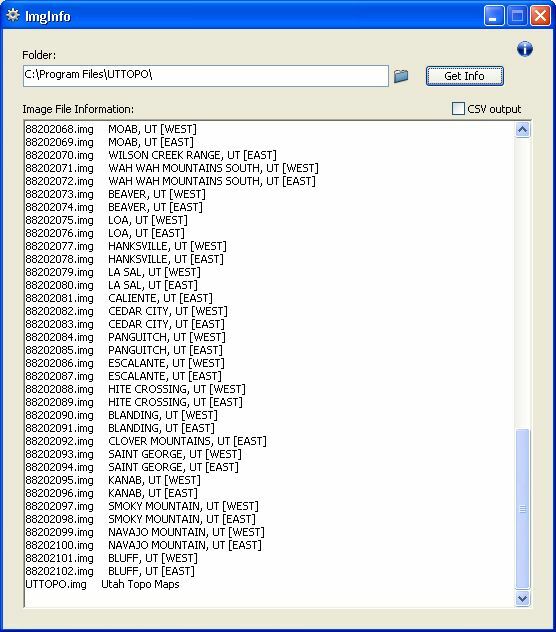 Click the "Get Info" button and the utility will scan the specified directory and display the area/description information for each .img file found. The results can be copied/pasted to other applications. The original perl script can be obtained here.